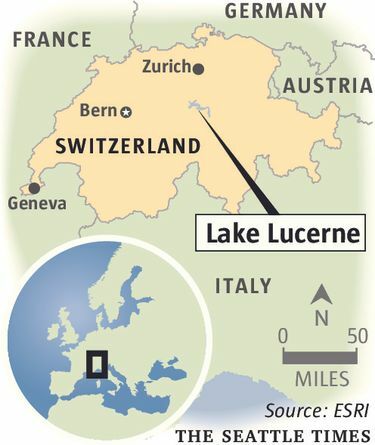 LUCERNE, Switzerland — Lake Lucerne winds through the Alps with a series of bends, S-curving around towering mountains like slalom skiers carving into snow thousands of feet above. But even though skiing gets all the glory in wintertime Switzerland, a ferry ride on the lake can also be a welcome diversion for a traveler with a few hours to spare. Just an hour’s train ride south of Zurich, the compact city of Lucerne has preserved its medieval treasures of cobblestone squares, timeworn shops and frescoed houses. Lucerne turned up on Travel + Leisure’s list of best 50 places in the world to travel in 2017. Pressed for time, you could walk from the train station through the old town, over the old wooden Chapel Bridge, and back to the ferry dock in 15 minutes. 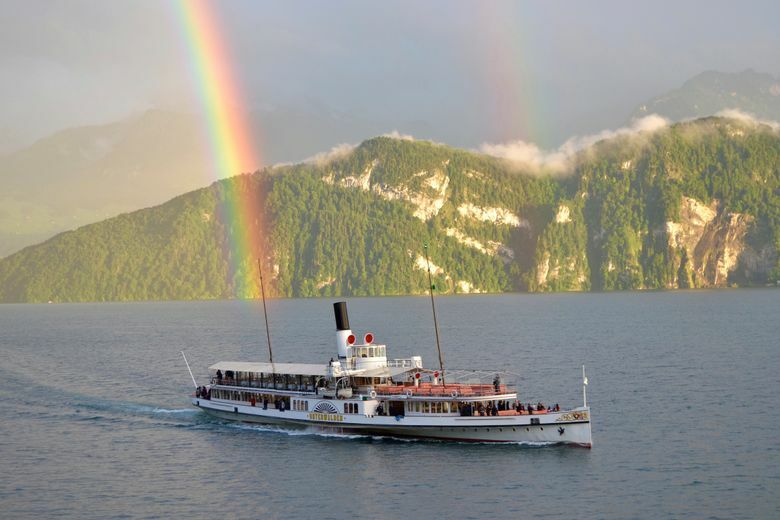 On my visit, I caught the Unterwalden, a 113-year-old ferry that seemed like a cross between a Mississippi River steamboat and a luxury ocean liner. The red center paddle wheel was propelled by matching red turbines visible in the open engine room on the lower deck. On the main deck, waiters tended to first-class passengers in wood-paneled dining rooms with white tablecloths. Two-hour lunch cruises run daily throughout the year (the last time the lake froze was in 1963) and go for just over $50 per person for three courses, not including the ticket price of the ferry, about $28. January’s menu, for example, features a starter of three kinds of bruschetta with lettuce, an entree of chicken breast stuffed with dried plums, and for dessert a white chocolate parfait. Dining is not required, though, and in fact, many Swiss who live around the lake use the ferries to commute. I was headed to Weggis, a lakeside village about 45 minutes away where you can grab a bite or just stroll through the storybook town of half-timbered buildings before heading back. In winter, fog often descends on the lake and its surroundings, draping the valley in a spooky but romantic atmosphere. On clear days, you’ll see the mountains rise from the crystal water with a flash of lush green at their forested base. You might even catch sight of a rainbow. Above the tree line, the mountains turn nearly black, cutting a menacing image that softens at the snowy peaks. Regardless of whether you use the ferry for dining or a destination, the spectacular views of the surrounding Alps are always included.